TRENTA! - I Blog, Therefore I Am. I turned THIRTY today and it was fabulous! There's a certain enigma and mystery in turning thirty. I am actually having the time of my life and I embrace thoroughly the changes in me and within me! I have so many thoughts for this milestone of a year but I am too pre-occupied at the moment with endless reading of the Twilight saga, catching up on missed work, resizing of pictures, watching the Olympic Swimming events, and getting ready for another quick business trip this weekend thus the non-post. For the meantime, I leave you with one of my "iconic" Boracay self-portraits which was taken just a few days ago. I want to immortalize the fun, carefree and relaxed atmosphere that Boracay brought within which I want to channel myself with. Cheers to thirty, flirty and thriving! Happy belated Birthday! Enjoy thirty! It's a lot of fun! Hi Abbie!!! Belated Happy Birthday!! Wishing you all the Best!!! David - Happy Belated Birthday, too! :D I love my 20s...self-discover and all that stuff! Is that a recent picture? You LOOK fab! :D Happy birthday. Thanks, Laarni! 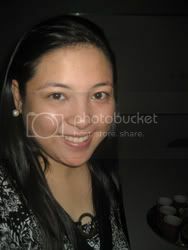 :) The picture was taken just last Sat., Aug 9.